Martin Luther King Jr. worked in the tobacco fields here. Martin Luther King Jr. could hardly believe his eyes when he left the segregated South as a teenage college student to work on a tobacco farm in Connecticut. "On our way here we saw some things I had never anticipated to see," he wrote his father in June 1944. "After we passed Washington there was no discrimination at all. The white people here are very nice. We go to any place we want to and sit any where we want to." The slain civil rights leader, whose birthday is observed Monday as a federal holiday, spent that summer working in a tobacco field in the Hartford suburb of Simsbury. That experience would influence his decision to become a minister and heighten his resentment of segregation. "It's clear that this little town, it made a huge impact on his life," said John Conard-Malley, a Simsbury High School senior who did a documentary with other students on King's experiences in Connecticut. "It's possibly the biggest thing, one of the most important things, people don't know about Martin Luther King's life." Until then, King was thinking of other professions such as becoming a lawyer, Conard-Malley said. But after his fellow Morehouse College students at the tobacco farm elected him their religious leader, he decided to become a minister. In his later application to Crozer Theological Seminary King wrote that he made the decision that summer "when I felt an inescapable urge to serve society. In short, I felt a sense of responsibility which I could not escape." "Perhaps if he hadn't come to Connecticut, hadn't picked tobacco up here, hadn't felt like a free person, hadn't felt what life was like without segregation and been elected the religious minister, he may not have become such a leader in the civil rights movement," Conard-Malley said. Nicole Byer, a junior at Simsbury High School who narrates the documentary, said King was roughly the same age as the students who produced the documentary. Such early experiences can have a profound influence on young people, she said. "Everything right now influences us," Byer said. "Any small experience can change the direction of what we do right now." In a letter to his mother three days after he wrote his father, King marveled over a trip he took to Hartford. "I never thought that a person of my race could eat anywhere but we ate in one of the finest restaurants in Hartford," King wrote. "And we went to the largest shows there." He wrote a week earlier of going to the same church in Simsbury as white people. His new calling as a religious leader was emerging, too. "I have to speak on some text every Sunday to 107 boys. We really have good meetings," he wrote. William Duschaneck, an 88-year-old Simsbury resident interviewed by the students, said he played baseball with King in town. King was a strong pitcher, though the future preacher of nonviolence never drilled a batter, he said. "He was a good ballplayer. He beat us a couple times," Duschaneck said, laughing. "It was interesting to hear him talk. He had a nice voice. He talked about God and so forth." King described the work on the tobacco farm as easy. "I have a job in the kitchen so I get better food than any of the boys and more. I get as much as I want," he wrote to his mother. In a speech in Hartford in 1959, King recalled how hot it was working on the tobacco field and how he looked forward to relaxing on weekends in Hartford. Byer said King and other students often worked in temperatures that reached 100 degrees or higher. The students, who were earning money to pay for college, made about $4 per day, Byer said. They lived in a dormitory built at the edge of the tobacco field. King was nicknamed "Tweed" by his friends because he often wore a tweed suit to church, said Alexis Kellam, whose late father, Ennis Proctor, worked with King that summer in Connecticut. King's friends teased him that the hot sun in the tobacco fields caused him to preach, his sister, Christine Farris, said. In her book "Through It All: Reflections on My Life, My Family, and My Faith," Ferris wrote that her brother underwent a "metamorphosis" as a result of his time in Connecticut. "That was quite an experience," Farris said. 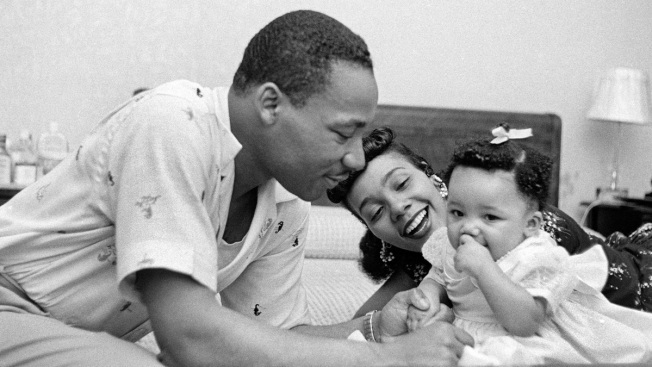 King's widow, Coretta Scott King, wrote in her memoir, "My Life With Martin Luther King Jr." that her husband talked of the exhilarating sense of freedom he felt in Connecticut that summer. That taste of freedom ended as King returned home. When he got to Washington, he had to ride the rest of the way to Atlanta in a segregated train. "After that summer in Connecticut, it was a bitter feeling going back to segregation," King wrote in his autobiography. "I could never adjust to the separate waiting rooms, separate eating places, separate rest rooms, partly because the separate was always unequal, and partly because the very idea of separation did something to my sense of dignity and self-respect." Clayborne Carson, a history professor and director of the Martin Luther King Jr. Research and Education Institute at Stanford University, said King's time in Connecticut played a role in his decision to become a minister and in influencing his views about segregation. He said shortly before King came to Connecticut that summer, a bus driver ordered him to give up his seat for a white passenger on the way to Atlanta. "These experiences came fairly close to each other," Carson said. "I think the two things together sharpened his sense of resentment about segregation in the South."